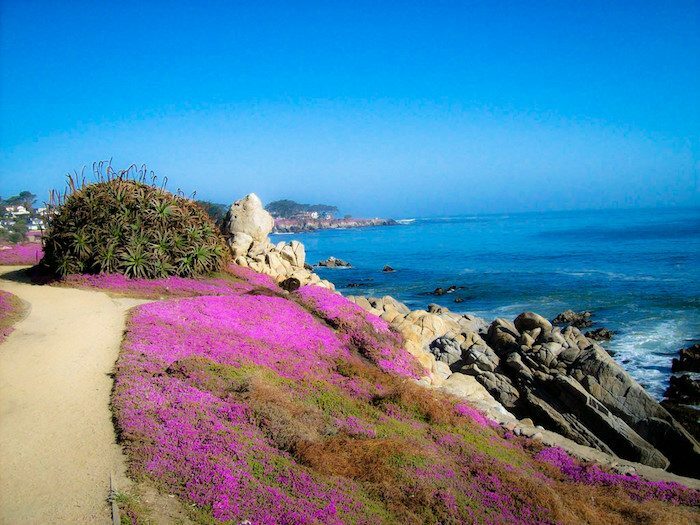 The Monterey Bay Coastal Recreation Trail, which spans the coast of Monterey between Pacific Grove and Castroville, is a beautiful 18 mile former railway, which is now a two lane paved path leading to some of the most notable tourist attractions in the area. With Monterey’s free trolley, it’s easy to hop on and off the path for a run of your choice length. However, we recommend the section between Lovers Point and Fisherman’s Wharf for its centrality, views, and landmark highlights, including the famous Cannery Row. Start out at Lover’s Point, wind through stands of Eucalyptus and past Window on the Bay before you reach the piers of Fisherman’s Wharf. From there, you can double back on the path for a 5.4 mile out and back. You can also, of course, start in Monterey and head the 5.4 miles to Lovers Point. 2.6 miles to Sand Dunes Dr. The Route 1 Bus will drop off right at the Ocean View/Rec Trail stop or park on Ocean View Ave.